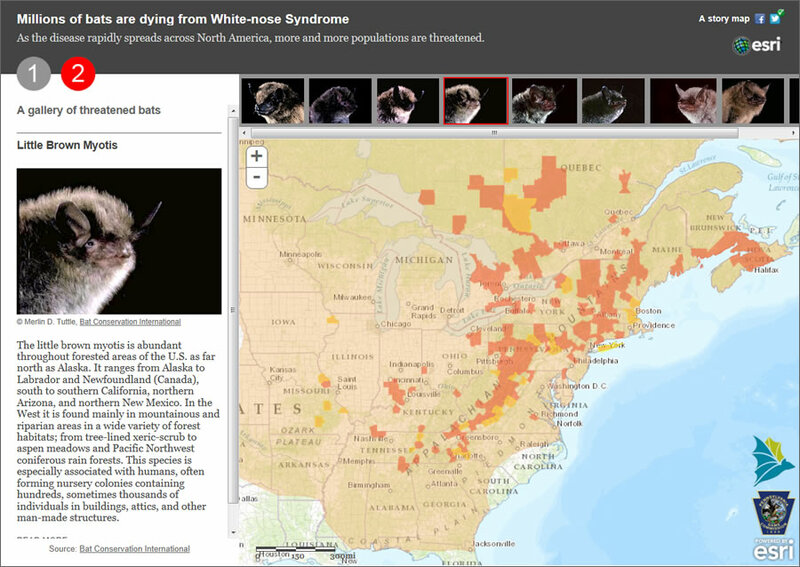 More than 5.7 million bats dead: that's the toll from white-nose syndrome (WNS), a fungus that's rapidly killing bats in the United States and Canada. This Esri story map illustrates the problem, showing how, over a five-year period, the disease has spread from one county in New York south into Alabama, west into Oklahoma, and north into the Canadian province of Quebec. Since Esri's release of story map templates, organizations and individuals from all over the world have been rapidly creating story maps online to showcase topics of interest: natural disasters, climate change, elections, unemployment, city attractions and historic sites, health care information, and much more. 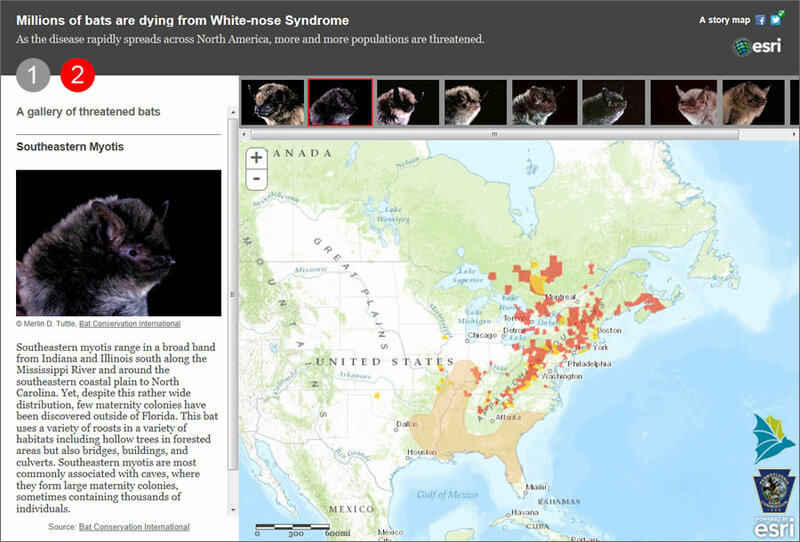 The story map showing the spread of white-nose syndrome in bats throughout North America was born out of a concern for the vulnerable mammals, which are important to the ecosystem. Bats feed voraciously on insects that might otherwise destroy crops, and according to Bat Conservation International (BCI), bats help pollinate plants and spread seeds. 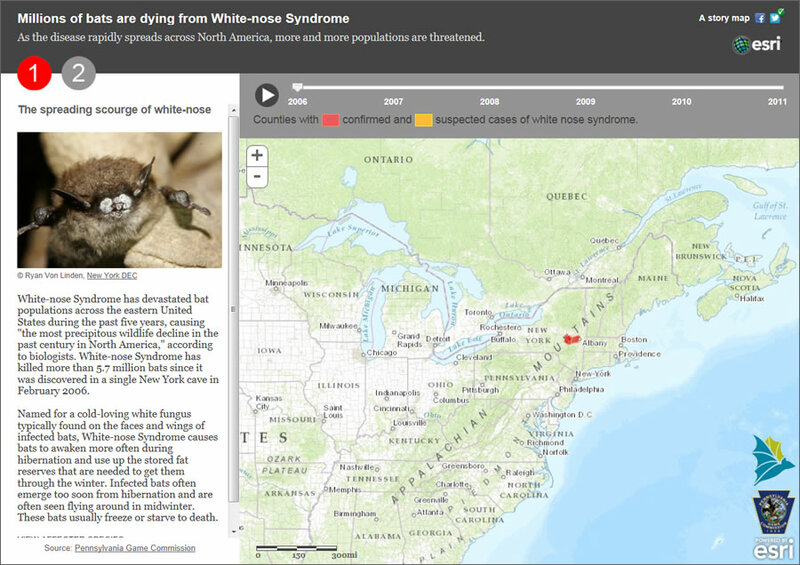 This story map raises awareness about a little known disease that's threatening an often misunderstood but vital member of the animal kingdom. Like pictures, all maps tell a story. Many people think visually, which is why using story maps is such a powerful way to present problems and, oftentimes, solutions. Maps also deliver complex information so it's readily understood and capture the tradecraft and knowledge of others in a form that's easy to share. Headed by Allen Carroll, former chief cartographer at the National Geographic Society, the Esri story maps team is focused on improving web map capabilities and developing new tools and application templates to unlock spatial data to tell stories. A good story map is based on authoritative content, and that's where using GIS and veracious data to tell interesting stories comes into play. The Esri story maps team's bat story map focuses on the problem of white-nose syndrome, using text; photographs; and a live, interactive map. 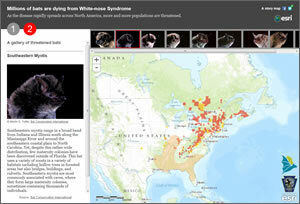 The text describes white-nose syndrome, profiles each of the nine affected species of bats, and details their habitat and range. A gallery shows photos of the impacted species. An accompanying live web map displays the US counties and Canadian provinces with reports of WNS as depicted in Butchkoski's maps. The story map also depicts habitat ranges, combined with a GIS animation of the spread of WNS. How did the story map come together? BCI provided the habitat ranges for the nine affected bat species—including the big brown bat and the grey myotis—in the form of shapefiles. 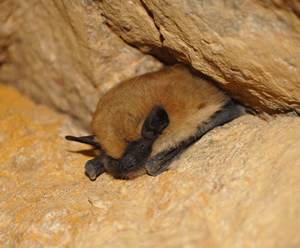 The organization also gave permission to use information from its website and provided a license for use of Merlin Tuttle's photographs of those bat species for the application, a key ingredient to the story map. After experimenting with animating the data using Esri's ArcGIS for Desktop, the story map team realized that Butchkoski's static maps showed more detail than was necessary for the story map application. Simpler is often better when communicating, especially for the general audience that would use the application. To simplify, his data was reduced to a two-color thematic map of suspected and confirmed cases, along with the date information used to drive the animation. 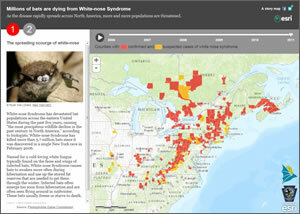 The application was well received and remains among the most popular in the Esri Story Maps collection. It has also generated some controversy and proved to be a catalyst for debate. But that's what good story maps are meant to do—present authoritative information in a compelling way to showcase an important topic and facilitate awareness and discussion.